Ready to be a princess? Then join Sofia for a magical celebration with our Sofia The First party supplies! This darling pattern features Sofia with her enchanting palace, carriage, and animal friends. Accents of purple, pink, and gold add pretty pops of color. And no royal ball is complete without some regal party favors! 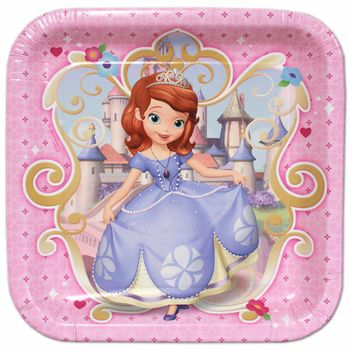 Disney Princess Sophia the First Birthday Party 9" Square Lunch Plates, 8ct. Disney Princess Sophia the First Birthday Party 7" Square Dessert Plates, 8ct. Disney Princess Sophia the First Birthday Party Lunch Napkins, 16ct. Disney Princess Sophia the First Birthday Party Beverage Napkins, 16ct. Disney Princess Sophia the First Birthday Party Plastic Treat Bags, 8ct. Disney Princess Sophia the First Tiaras, 4ct. Disney Princess Sophia the First Water Color Paint Boards, 4ct.